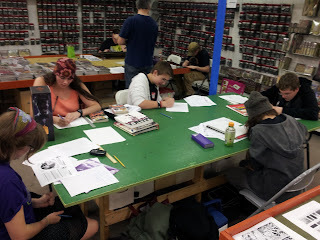 Back in late September, the art teacher at my school approached me about working together to sponsor a 24 Hour Comic Book Day in conjunction with a local comic book store, Borderlands Comics and Games in Greenville. 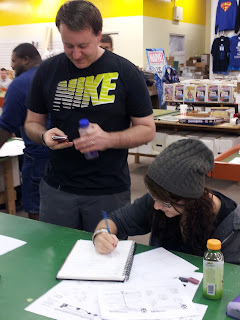 The idea behind 24 Hour Comic Book Day isn’t simply to read and share comic books for 24 hours, but to actually create your own 24 page comic book…in 24 hours! 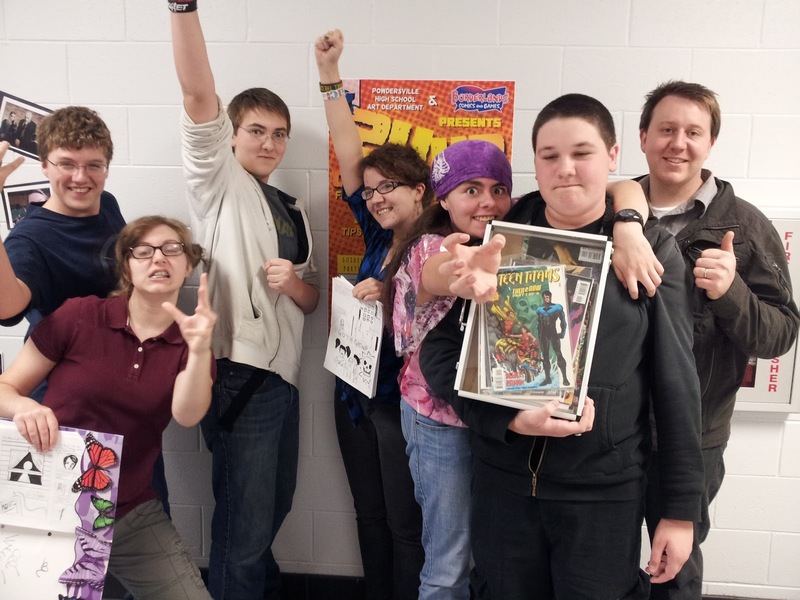 This isn’t an original idea – people take part in 24 Hour Comic Book Days in various places all around the country, usually in October – but it’s a first for our school and this area. 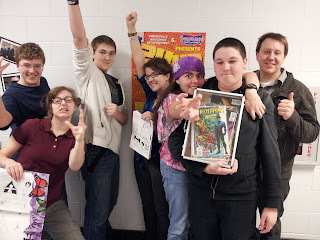 Like most high schools, Powdersville High has a segment of students who are FANATICAL about their comics and mangas, so Matt thought it would be a great idea to host a 24 Hour Comic Book Day event of our own and get these comic fans of ours involved. 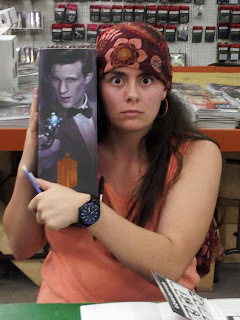 Borderlands is a local comics store with a thriving patronage – drop by anytime, and you’re likely to see patrons browsing the shelves for comics, checking out the many collectible action figures, or gathered around tables in the back RPG-ing. 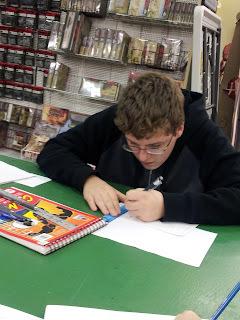 Our art teacher, Matt Tolbert, contacted Borderlands to see if the store would be willing to host the event and store owner Rob Young, whose son Jacob is a Freshman at our school, couldn’t have been more gracious and excited to help sponsor the event. 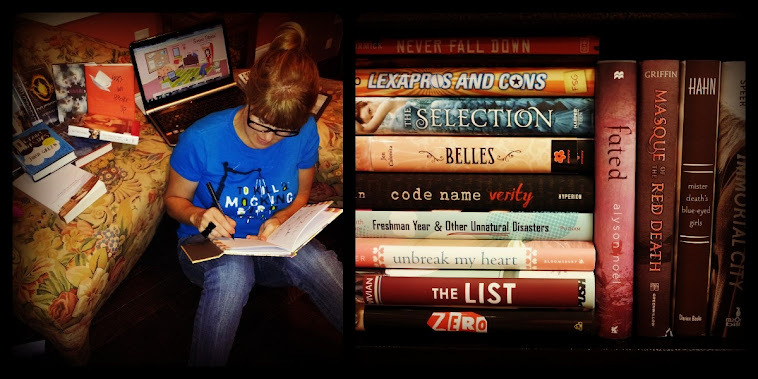 We set the date for Friday, October 19, at 7pm until October 20, 7pm, which coincided with YALSA’s annual Teen Read Week - how’s that for awesome timing?! Students registered for the event through me or Mr. Tolbert – and by registered, I mean told us they were planning to come. We mostly wanted a head count for food and art supplies. Mr. Tolbert provided paper, pencils, erasers and inking pens, while Borderlands provided foodstuffs (think junk food!). Students began arriving around 6:30 on Friday with their own art supplies, snacks, Red Bulls, and – best of all – wonderful senses of humor. Many had never been to Borderlands before, so they took those first few minutes to fanboy/fangirl over all the stuff in the store! 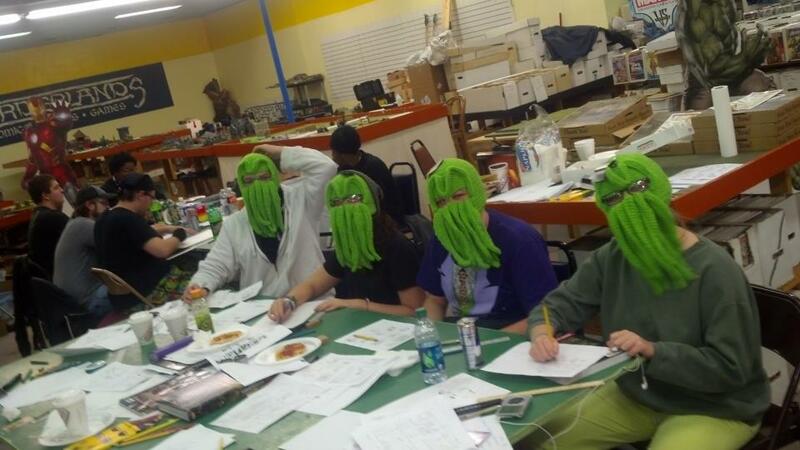 Around 7:00, the students gathered at a table set up for them and began preparing to draw. Mr. Tolbert provided template sheets with the comic panels, so students could choose the layouts they wanted and begin creating. We started out with 5 students, but one more joined them around 10:00 that night. All told, 6 students participated in the event though other students from our school came by at different times throughout the 24 hour period to see how things were going. So how did they go? Ask any of our participants, and they will tell you they had a lot of fun! Not everyone finished a book or stayed the whole time, but they had a blast while they were there. Most had never visited the store before and were enthused to find a new haunting ground for shopping and networking. Students also enjoyed the bonding experience, hanging out with students they may not have classes with at school but definitely share their love for comics and art. Though Matt Tolbert made it through to the end and almost finished his own comic, unfortunately none of our students made it the entire 24 hours. Our last couple of students bailed around 12:30pm the next afternoon. As they explained, they were either done with their books and saw no reason to stay longer or sleep deprivation had finally gotten the best of them! One thing Mr. Tolbert and I hadn’t considered was that these kids were technically up since Friday morning, Friday having been a regular school day. Unless a student grabbed a nap between school and the event – which none had! – a student would have been awake 36 hours by the end of the event. Yikes. 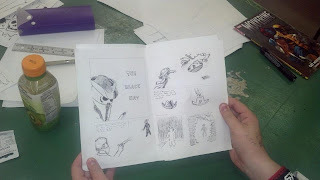 Also, we had 10-12 more students who really wanted to participate in creating their own comics, only they had prior commitments and couldn’t attend. Although 24 Hour Comic Day is typically held in October, for our high school crowd, the months of January and February might be best for future Comic Book Days. Students typically have fewer pulls on their time in the winter months. Also, doing it on a Saturday – Sunday OR on a school holiday might help students get caught up on sleep ahead of time. Despite a few glitches, the event was such a cool experience for myself, the teachers, students and Borderland patrons involved, and hope to make 24 Hour Comic Book Day an annual event for our school and area. Rested and back at school on Monday - rock 'n roll! !